The final guest post is from my dear friend Razeena at Read Little Muslims. I’m not sure if I ever mentioned this, but Razeena and I are not only virtual blogger friends but friends in real life too. We live a few minutes from each other, run in the same circles and have a shared enthusiasm for Islamic books/resources. Even our sons are good friends and are the same age too (they just turned 4, where does the time go, Alhumdulillah). 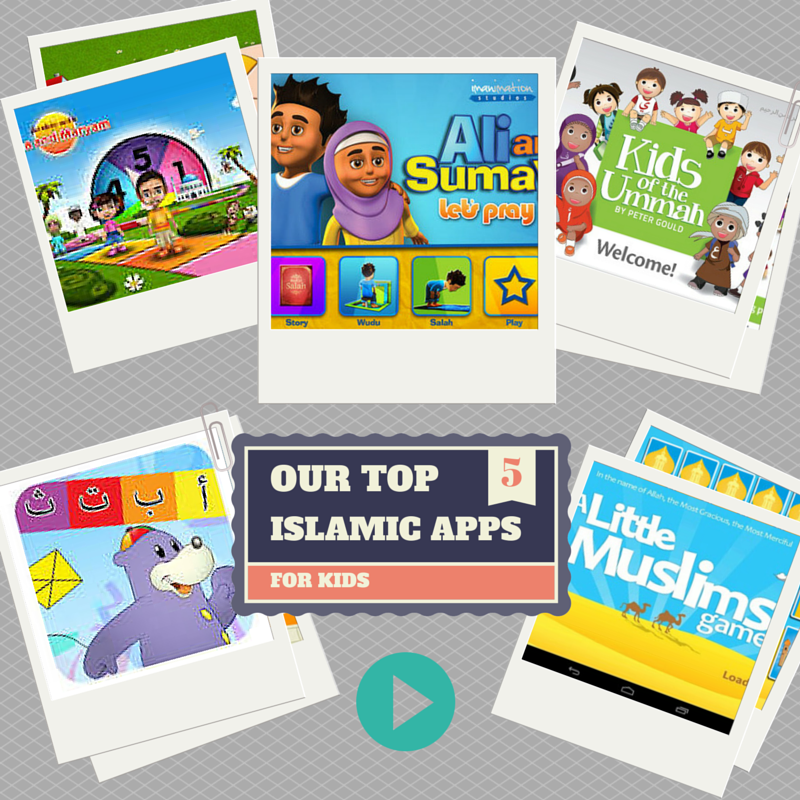 Razeena has put together a great list of their top 5 Islamic Apps. I have all of these and they’re definitely favourites in our house too. An extremely high quality and well designed app. The two characters are just so cute and the little introduction to why Sumaya wants to learn to pray is endearing. 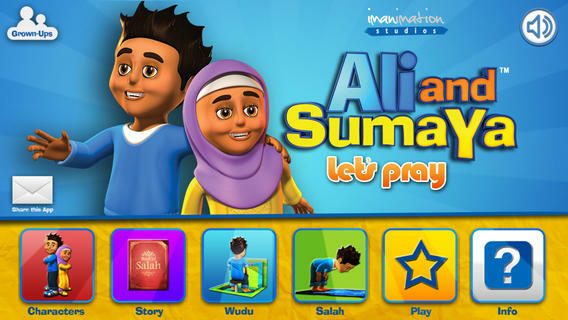 We love that it makes learning Salaah so relatable for young children. The easy-to-follow steps for making wudhu and Salaah make it seem lessdaunting to learn. The animation is fantastic and our kids have learnt so much. We can’t wait to see if there will be any more Ali and Sumaya apps. 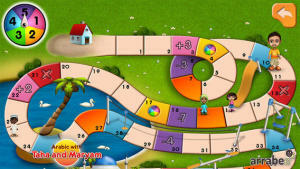 A simple yet well-designed board game-style app that makes learning the Arabic alphabet fun and easy. You can choose from four characters and three different levels. The game works by simply tapping the dial and moving your character the number of spaces you have spun. Once on your spot, depending on the level you have chosen, you have to identify the Arabic letter that pops up. Every few turns you are introduced to a new letter and the best part is that you can store your names, and the app will remember you the next time round. A fun, interactive way to learn! 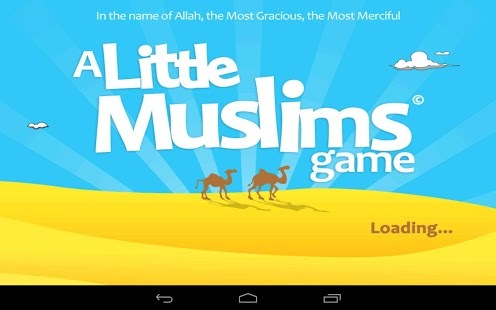 Another high quality app for Muslim kids. Designed by the well-known Peter Gould, the Kids of the Ummah are cute and colourful. 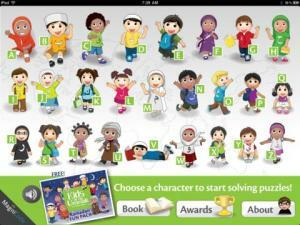 The app features 26 kids, each one’s name corresponds to a letter of the alphabet and a city in the world. There are puzzles of 26 different mosques worldwide and the illustrations and graphics are beautiful. It also features colouring and book mode. This is a fun, interactive app useful for exploring diversity. Zaky is a well-known character worldwide. Most children will lovingly recognise the familiar purple bear. Our favourite Zaky app at the moment is this one. We love the Arabic alphabet song. It is catchy and useful when trying to teach young children. Also, introducing them to the colours and animals is a bonus with out making things too serious. It keeps their attention unlike some of the other apps that try to teach similar things. A cute, simple memory match game with an Islamic twist. It has two levels of play – easy and hard – which is great for younger kids. The matching pictures include the Ka’aba, Masjid and Zakat among others. Once you find the match, a little voice gives you an explanation of the picture. This app is a nice alternative to other matching games that can give children that little extra. Other than one or two of these, I haven’t heard of the others. I’m so glad youposted this, because I’ve been meaning to download some Islamic stuff on the iPad for Zunoon now that he’s older and has more understanding. Yeah, great idea. This is such a great selection by Razeena but there’s so many more, I’ll have to attempt a more extensive post one day 🙂 Just watch out though, if you download them, you won’t be able to pull the iPad away from him! Are they all only available on apple products? Are they coming to android/Google play store or amazon app store? For those who do not have apple products.